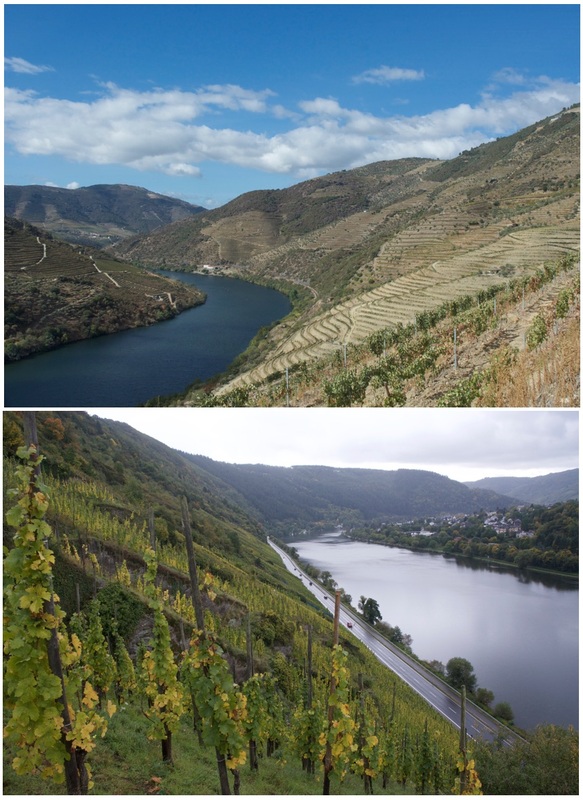 Two of the most famous wine regions along the rivers are probably the Douro in Portugal and the Mosel in Germany. Both have similar topography - winding rivers, steep slopes with altitude between 400 and 600m planted with vines, and of course spectacular scenery. However, this is where the similarities end. The differences in climate, soil and grape varieties make the wines produced in these two regions a world apart. 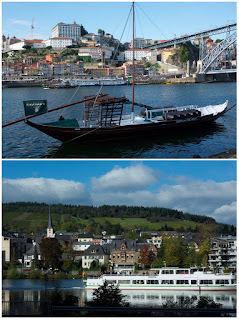 After spending a few weeks in the Douro Valley, I went straight to the Mosel. It was fascinating to compare and contrast these two regions, learning and understanding why their wines are so different. First let’s look at the Douro. The river is nearly 900km long flowing from Spain but only the last 200km is in Portugal. The wine region, also called Alto Douro, is situated to the east of Marão Mountains and stretched nearly to the border of Spain. The three sub-regions from west to east are Baixo Corgo, Cima Corgo and Douro Superior. The climate is largely continental with hot, dry summers and cold winters. Rainfall drops progressively from west to east with around 1,200mm per annum in Baixo Corgo to 700mm in Cima Corgo and down to less than 400mm in Douro Superior. The soil is mainly schist, stony, poor and with good drainage. The Douro is the world’s largest area of mountain vineyard, and is one of the wildest wine regions in Portugal, if not the world. Although harsh, wine has been made in the region for over 2,000 years and the vineyards were demarcated in 1756. The Douro was classified as a UNESCO World Heritage site in 2001 because of its historic, narrow, stone-walled vine terraces. Turning to Mosel, a tributary of the Rhine and only 545km long, also has some 200km flowing in Germany. Vineyards are found along this stretch of Mosel River and its tributaries, the Saar and Ruwer. The region is divided into Southern Mosel, Middle Mosel and Lower Mosel (also known as Terraced Mosel). It is pretty much at the other end of the climate spectrum comparing to the Douro with cool summers and mild winters where average annual temperature is around 10ºC across the entire region. Annual rainfall is between 670mm in Lower Mosel and 900mm in Southern Mosel. Soil varies in the region, from gravels and sands on flat land to quartzite sandstones in Lower Mosel. The 400 million old Devonian slate in all colours: blue, grey, brown and red, can be found in half of the vineyards. 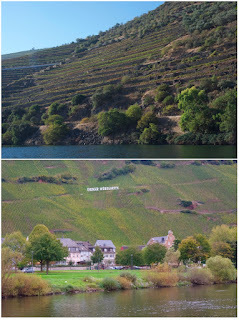 Mosel is the world’s biggest steep slopes wine region (over 18º, 30%), with the steepest one at 67º. 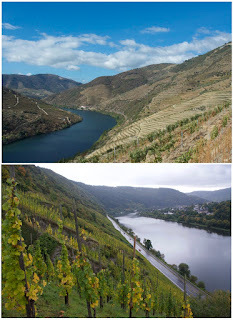 In the Douro, temperature and rainfall, not soil, are the deciding factors of viticulture. Port is made from ripe and concentrated grapes, and top quality port vineyards have often been planted on the lower slopes in the deep, hotter and drier Douro valley, where the yield is low. These days, producers may plant red varieties on north facing slopes or at higher altitude (300 to 400m) to produce fresher grapes for blending. Recently, some wineries are experimenting with international white varieties such as Sauvignon Blanc and Gewürztraminer planted at around 500m above sea level with encouraging results; and there is even a sparkling wine producer with vineyards on the high slopes of Alto Douro. In contrast, the climate in the Mosel region is fairly similar but the many different soil types make it possible to produce wine of different expressions. Riesling and slate are made for each other. 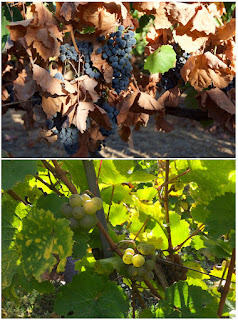 Blue slate Riesling highlights the minerality while red slate Riesling has more stone fruits aromas. The famous Grand Cru site, Ürziger Würzgarten with red volcanic rocks, gives Riesling a distinctive spicy flavour. Müller-Thurgau thrives on the gavel and sand, while the Pinots - both Weissburguder (Pinot Blanc) and Spätburgunder (Pinot Noir) are at home on limestone and marl soils. However, because of its cool climate, no vineyards are planted on the north-facing slopes. 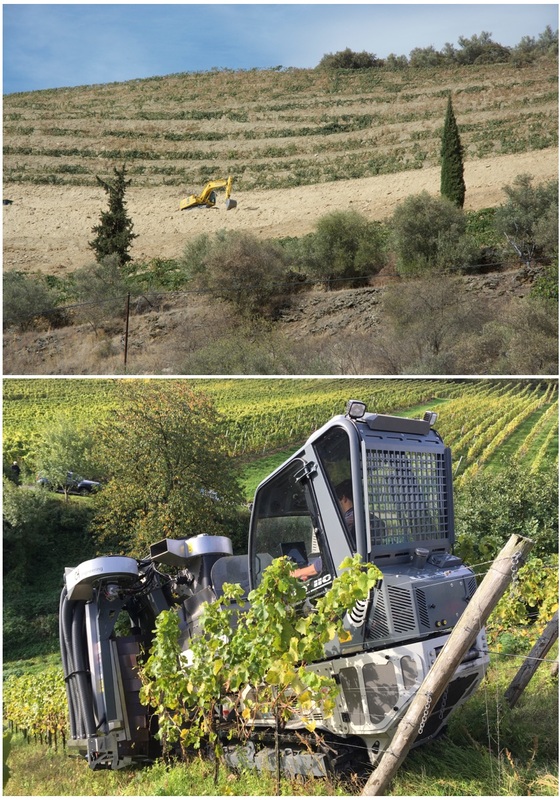 Both wine regions face challenging conditions in planting vines on slopes. In the Douro, terraces, both the narrow ancient walled terraces with only one or two rows of vines and the more recent, broader patamares (platforms) are necessary on steeper slopes, while vinha ao alto (vertical vineyard) where rows of vines on wires running up and down the slopes is the preferred technique on gentler slopes of around 20º (30%). In the Mosel, vertical plantings using wires can often be seen on slopes steeper than 20º and monorails are used for transporting materials up and down the slopes. Only on the steepest slopes are terraced vineyards. Vines on recently planted vineyards, whether vertical plantings or on terraces, are trained on wires but in older vineyards, vines were planted individually with a stake and trellised in Mosel Arch, where two canes are bent into heart shape, to prevent soil erosion. Because of the terrain, only limited mechanisation can be used and harvest is totally done by hand in both regions. Having said that, a German company has developed an award-winning steep slope harvester in 2016 that can work on both slopes up around 35º, and narrow terraces. A producer in the Douro has bought the machine and a few Mosel wineries rented it for the 2017 harvest. Since it is more and more difficult to get manpower for harvest, and that the machine can pick gently and a lot faster than man (it works as fast as 40 people), it won’t be a surprise that more wineries will opt for at least partial machine harvest in these regions. As for grape varieties and wine styles, the majority in the Douro are indigenous grapes where some 30 of them can be used to make port, a fortified wine where the best can be aged for over 100 years. Still wine, predominately red, has been made in the region for a long time but it was only in the last 20 years or so that it was being noticed. Today, a few producers focus on producing still wine (both red and white) and some even experiment with international aromatic white varieties planted at high altitude. Blending is essential for port but most still wine are also blended from different local varieties. In Mosel, on the other hand, over 90% wine is white of which 2/3 is Riesling, and nearly all wine is 100% single varietal. Riesling grown on different soils has different expressions and it can be made in sparkling and from dry to sweet. The rare sweet wine, Trockenbeerenauslese (TBA), like port, can age gracefully for over 100 years. Both regions have spectacular scenery but again in opposite spectrum. Vineyards in Douro are remote and rugged. On top of the vineyards, you either feel you are very small or you own the whole world depending on your state of mind. But on most Mosel vineyards, you enjoy the space while the view of village, and therefore civilisation, is always in sight. Most wine lovers are aware of the facts above but it’s an inspiration to be in both places at the same time. I was in the Douro making and tasting big red wine only five days before I was in Mosel making and tasting the delicate Riesling. Both regions make fantastic wine and I think this is the best illustration of terroir - a combination of climate, soil, geography and man (to plant the right varieties in the right place). Luckily, both regions are tourist-friendly. Plan your next holiday in one of the regions or even better, visit both regions and see for yourself the contrast like I did. Vila Nova de Gaia, just across the city of Porto, is a mecca for port lovers where major port houses age their wines in lodges. Cellar tours and tastings designed for all levels of engagement are offered, and you can pamper yourself in The Yeatman, a luxury wine hotel and spa in Porto with spectacular views over the UNESCO World Heritage city and the Douro River; or enjoy Northern Portuguese cuisine at Vinum Restaurant & Wine Bar in the Graham’s Lodge. It is easy to do a day trip to Pinhão in the heart of the Douro to visit a few more port houses and wineries. However, the best is to spend a few days in the valley and take the boat cruise to admire the vineyards from river level. As for Mosel, numerous villages dotted along the river and and there are always cellar doors/wineries in or very close to villages that welcome wine lovers. If you are there during harvest, you can try federweisser (fermenting grape juice) in some wineries. You can hop on and off boats to visit these historical villages, notably Cochem, Traben-Trarbach and Bernkastel-Kues. For the energetic ones, go cycle along the river or hike up one of the steep vineyard sites.